"All The Heckled Hemp She Can Spin"
Did you know that the original Hempfield Township in Lancaster County, Pennsylvania, was named for the vast amounts of hemp raised there? Did you know that hemp was grown on virtually every early farm in Pennsylvania and was considered a vital necessity? 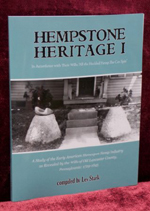 Learn the fascinating details of this old Pennsylvania industry in Hempstone Heritage. Author Les Stark shines a light into the past by revealing to us the wills of our ancestors who by leaving hemp in their wills to the descendants left us a unique way to study how hemp was actually used in the colonial and early American household. In 1999 and again in 2000, the Lancaster Farm Bureau passed resolutions urging the re-introduction of hemp into the County. In November 2000, the Pennsylvania Farm Bureau also passed a resolution calling for hemp to be re-introduced to Pennsylvania. Learn how a revived hemp industry could benefit farmers, create jobs, and help to stem the tide of destruction in the Garden Spot of the WorldLancaster County, Pennsylvania. One dollar for every book sold goes to the Lancaster Farmland Trust to help preserve our farmland.